Valtteri Bottas driving his Mercedes to victory at the Russian Grand Prix on Sunday. Formula One heads home after four opening long-haul races with the championship finely balanced between champions Mercedes and Ferrari and the prospect of an intense battle stretching out ahead. With the European season proper starting in Spain next week, and teams promising upgrades and a faster pace of development, the two frontrunners return to their factories with two wins apiece. Mercedes have a one point lead in the constructors’ championship while Ferrari’s Sebastian Vettel, with two wins and two second places, is 13 clear of Mercedes’ Lewis Hamilton. 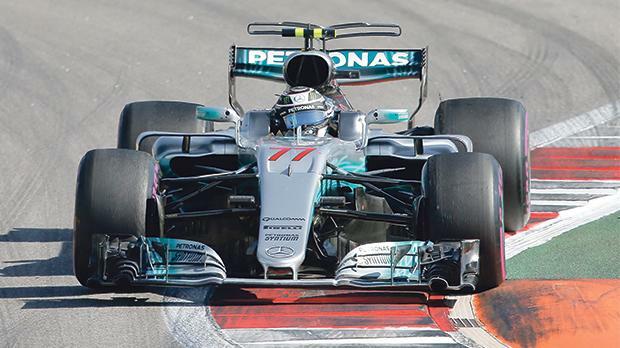 “It’s going to be extremely close,” said Mercedes team boss Toto Wolff. “More than very. They (Ferrari) came out of the winter with a good car and it seems to suit Sebastian a lot. And we just need to stretch ourselves to perform as good as we can,” added the Austrian. So far success has alternated between the two teams, with Vettel winning the opener in Australia, Hamilton in China, Vettel again in Bahrain and Valtteri Bottas taking his career first success in Russia for the team he joined in January. In 2016, Mercedes were dominant and won all but two of the races with 20 pole positions from 21 starts but resurgent Ferrari – who won nothing—have already recast the 2017 landscape. Vettel’s pole in Sochi was Ferrari’s first since 2015 and the front row lockout the first grid since 2008 with both red cars at the front. There can be no doubt now that the sport’s oldest and most successful team are back with a vengeance. The split between the Mercedes drivers has favoured Vettel, whose own Finnish team mate Kimi Raikkonen has scored 49 points to the German’s 86 while Hamilton and Bottas are separated by just 10. Red Bull are a distant third at present, with Max Verstappen and Daniel Ricciardo fifth and sixth in the standings, but they too could get back into the mix if impending upgrades to their engine and chassis are as good as they hope. “I think it will be a very close race between Mercedes and us...and I also hope that Red Bull find some pace,” said Vettel, who won his four world championships with that team before joining Ferrari. Verstappen won for Red Bull in Spain last year, his first career victory, after Hamilton and now-retired team mate Nico Rosberg collided on the first lap and nobody is taking anything for granted now. “Everybody will come with upgrades for Barcelona,” Mercedes’ non-executive chairman Niki Lauda told reporters. “The season will start anew and then who has the better upgrades, and makes the quicker car, we don’t know yet. We will see in Barcelona and practice and then the race,” added the Austrian.